Some sea lions suffer from a form of epilepsy that bears a striking resemblance to epilepsy in humans. That insight could help scientists develop treatments and eventually find a cure for temporal lobe epilepsy, one of the most common forms that people get. California sea lions can get seizures and eventually develop epilepsy when they're exposed to domoic acid, a toxin produced by some algae blooms. The Marine Mammal Center in Marin County treats sea lions suffering from seizures, but in some cases has to euthanize them. I talked with Dr. Paul Buckmaster, a neurologist at Stanford University who's studying the sea lions at the Marine Mammal Center. This is an edited version of our conversation. Why is this comparison with people important? It's important for the sea lions because it gives us a better understanding of what's causing their epilepsy as well as the behavioral problems they show after being exposed to the toxin. Those problems are so severe that those animals will suffer if they're released—they will starve to death. Now, they're being euthanized—in a way, to prevent their suffering. It's a really serious problem for them. It's important for people because we're still trying to understand what causes seizures in people with temporal lobe epilepsy. One of the main ways we study that is by studying mice and rats, but the brain damage in mice and rats is not as similar to people as the brain damage in sea lions. So we might be able to learn more about human temporal lobe epilepsy by studying the sea lions. One of the areas that we're working on now is to widen our view. Instead of just focusing on one part of the brain—the part that's most damaged in sea lions and in humans—we're looking at other parts of the brain as well. We might get some clues because we can get better images of the brains of sea lions than we can of people anatomically. We're able to preserve the tissue better. We can also use additional stains and look at more areas of the brain than we can in people with temporal lobe epilepsy. If we find some parts that might be damaged in sea lions that haven't been recognized in people yet, we can direct the clinicians towards those areas, and say, "Look in these spots as well. See if you can find anything using non-invasive imaging techniques." We might find some additional areas that are damaged that might be important and contribute to the seizures that people have. Are there any connections between domoic acid and epilepsy in humans? In humans, there was an outbreak in the late '80s when a bunch of people ate this toxin because it was in the shellfish they were eating. This was in the Montreal area, and the mussels came from Prince Edward Island where they were cultivated. A lot of people became sick. They had gastrointestinal symptoms. Some of the more severe cases also had seizures and memory loss. In some cases, that memory loss was permanent. They couldn't make new memories after that. One of those patients who had the severe symptoms later developed epilepsy. So it's possible for people to develop epilepsy if they eat this poison. But now seafood that's available in restaurants and seafood stores is screened. Is there a possible treatment for the sea lions? No, there's not. That's what's really frustrating about this. In people, if they had developed epilepsy after eating the toxin, you would prescribe them anticonvulsant drugs. Then, they could take those on a daily basis to help control their seizures. We can't do that with sea lions. The sea lions are wild animals. They are only at the Marine Mammal Center for treatment and rehabilitation, and then they must be released. There's no way for them to continue treatment. 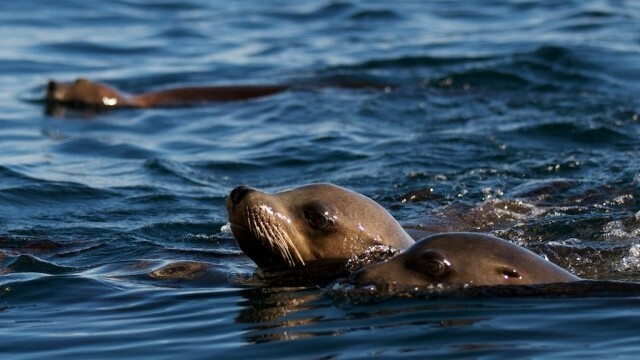 How are different populations of sea lions and other animals affected? Algae has population explosions called algal blooms. There are general trends, but they're harder to predict on a finer timescale. They occur in focal areas along the coast, and if a sea lion is in the wrong place at the wrong time, they can be exposed and become intoxicated from the algae-made domoic acid. Other species are affected as well, not just sea lions. This was reported to cause a bunch of birds to die. Early on that was reported in the Santa Cruz area, there were brown pelicans and cormorants that were affected from the toxin. It's also suspected -- and there are some anecdotal reports -- of it killing dolphins and possibly whales. In those cases and others as well, if the animal is affected but it just dies and sinks to the bottom of the ocean, no one might recognize it. With the sea lions, in many cases, they're able to get to the shore where they're found having seizures. Part of the reason it might seem more common in sea lions, it's just recognized more frequently in sea lions because they're abundant and they tend to end up in places where people will find them.